Windows vista Service Pack 1 (SP1) for Arabic, Bulgarian, chinese (simplified), chinese (Traditional), croatian, czech, Danish, Dutch, English, Estonian, Finnish, French, German, Greek, Hebrew, Hungarian, Italian, Japanese, Korean, Latvian, Lithuanian, Norwegian, Polish, Portuguese (Brazil), Portuguese (Portugal), Romanian, Russian, Serbian, Slovak, Slovenian, spanish, Swedish, Thai, Turkish, Ukranian, chinese Hongkong SAR languages are now available for free and direct download from microsoft for all licensed windows vista users. Read the overview of Windows Vista SP1 , including technical details, guidelines and notable changes. Read the Deployment Guide for Windows Vista SP1. This guide would give technical information, procedures, and recommendations for installing Windows Vista SP1 in a business or corporate environment. Windows Vista Service Pack 1 (SP1) is also distributed via Windows Update, or Automatic Updates, if enabled on you computer system or PC. However, this will take time and for those who can’t wait, download the appropriate version of Windows Vista Service Pack 1 (SP1) from the above direct download links. 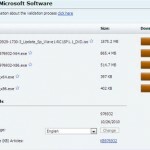 Microsoft strongly recommends using Windows Update to download and install Windows Vista SP1 on single PCs. Some Windows Vista users may encounter an issue with a small set of hardware devices that may not function properly after updating a Windows Vista PC to Windows Vista SP1. This is an issue with the way the device drivers were re-installed during the Windows Vista SP1 update process, not with the drivers themselves.These drivers worked on Windows Vista RTM and they work on Windows Vista SP1. This problem is typically corrected by simply uninstalling and reinstalling the driver. We are working with the manufacturers of these devices to get the known problematic drivers and their install programs updated, and also on other solutions we can use to ensure a smooth customer experience when updating to Windows Vista SP1 using Windows Update. For new PCs provisioned with Windows Vista SP1, this is not an issue. 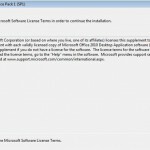 If your computer system or PC has a prior version of the Windows Vista Service Pack 1 (SP1) beta installed, you must uninstall it prior to installing this final version. Use the Control Panel applet “Programs and Features” and select “View installed updates” from the top left of the task pane. Under Windows, look for “Service Pack for Windows“. Click Start –> All Programs –> Accessories –> System Tools –> System Information. Check the Value element of the Version item.The value will indicate which service pack you have installed. Note that The version number will vary if you install other updates to Windows Vista after you install Windows Vista SP1. Download the official versions of Windows vista Service Pack 1 (SP1) for Arabic, Bulgarian, chinese (simplified), chinese (Traditional), croatian, czech, Danish, Dutch, English, Estonian, Finnish, French, German, Greek, Hebrew, Hungarian, Italian, Japanese, Korean, Latvian, Lithuanian, Norwegian, Polish, Portuguese (Brazil), Portuguese (Portugal), Romanian, Russian, Serbian, Slovak, Slovenian, spanish, Swedish, thai, turkish, Ukranian, chinese Hongkong SAR languages.